Aldo Conterno brought the American dream to Barolo. Aldo Conterno, one of Barolo's most renowned winemakers, died May 30, in his hometown of Monforte d'Alba, according to his family. He was 81. Since he parted ways with his brother and founded his winery in nearby Bussia in 1961, Conterno helped elevate Barolo's identity around the world. Against the warnings of his father, Conterno sidestepped tradition and made wine the way he wanted to. He was a pioneer years before a generation of rebels brought modern techniques and marketing savvy to the Langhe. Conterno was born in 1931, the second son of Giacomo Conterno, a second generation winemaker who had built a well-known business buying grapes and producing wine. Giacomo was best known for his cuvée Monfortino. In 1954, Aldo left the Langhe, however. Two uncles who lived in San Francisco wanted to start a winery in Napa Valley and asked Giacomo if his younger son could be the winemaker. Aldo enjoyed America, but soon after he arrived, he was drafted and ended up spending two years stationed in the U.S. Army in Korea. Many people would have cursed their luck. "To me, it was a great experience. It was great because I learned English," Conterno told Wine Spectator in 2010. Through his fellow soldiers Conterno said he also learned the emphasis America put on innovation and hard work. Everything was considered possible. That was a sea change for a young man in his twenties from a region where tradition was paramount. But one of Conterno's uncles died while he was in Korea, and soon after he returned to California, the winery project fell through. Conterno returned home to Italy. There, he and his older brother Giovanni began to clash over the future direction of their family winery. Both sons had been trained as winemakers. But whereas Giovanni, who had never left Piedmont, wanted to honor tradition, Aldo, who had spent nearly five years out in the world, saw endless possibilities for innovation. "My father said, ‘You'd better split up. But do it the way I say. Don't take it to any lawyer.'" The brothers divided up the equipment and inventory, and parted ways. Conterno established Poderi Aldo Conterno just down the road and began buying top vineyards. He foresaw that with demand for Barolo rising, winemakers could no longer rely on purchased grapes. He would create three great single-vineyard wines—Cicala, Colonello and Romirasco. 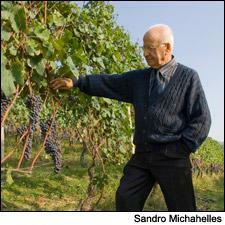 In great years, he blended grapes from the three to make a reserve wine called Gran Bussia. He also began tweaking methods in the winery. With better fruit, he believed he could shorten maceration times and create less tannic, more elegant Nebbiolos. Several years before a younger group of winemakers made more radical changes, Conterno's wines garnered international attention. In recent years, Conterno was semi-retired, leaving control of the winery to his three sons. But he was still a force at the winery and in the local community, someone whose opinions mattered greatly to the newer generation of winemakers.